Faced with a grim market at home, the Trump administration is increasingly looking abroad to bolster ailing U.S. coal companies. Its efforts couldn't come at a better time for the industry. An administration official revealed plans to court other countries to buoy coal Monday, just as global leaders were preparing to meet at the One Planet Summit in Paris to mark the second anniversary of the Paris climate accord (E&E News PM, Dec. 11). President Trump, who has signaled that the United States will exit the climate pact, was not invited to the summit, in a perceived snub by French President Emmanuel Macron. The Trump administration initiative, known as the "Clean Coal Alliance," drew scorn from environmental groups and countries that said political and market winds are blowing against coal. "In one word: deluded," Sasanka Thilakasiri, a senior policy adviser with Oxfam America, said in an email of how he would describe the effort. "No matter how it is spun, there is no such thing as 'clean coal,' for it will always be one of the more damaging, polluting and, above all, expensive energy investment choices that could be made." The push coincides with a favorable turn in market conditions for U.S. coal producers, giving the Trump administration a chance to seize on those dynamics and claim a win for its allies. Analysts say we're in a period of increasing global demand that ostensibly boosts the prospects of U.S. coal exports. It overlaps with Trump's first presidential term. Total U.S. coal exports through October are up by 70 percent to more than 70 million metric tons, according to Platts. Exports of metallurgical coal used in steel fabrication have been strong throughout the year. Shipments of thermal coal used in electricity generation are also surging. Bituminous coal exports, largely from the eastern United States, were 23 million metric tons through October, an increase of 61 percent over 2016, Platts reported. "They don't show any signs of slowing down," said Joe Aldina, an analyst who tracks the coal sector at S&P Global Inc. "There is a lot of interest from abroad in buying U.S. coal." That could give the impression that Trump is delivering on campaign pledges to aid the hard-hit coal regions, from which he draws political support. An international effort like the one the White House is convening could help prop up export destinations for U.S. coal and technology — and, therefore, jobs — by throwing coal a longer lifeline through broad, global backing of the fuel source. 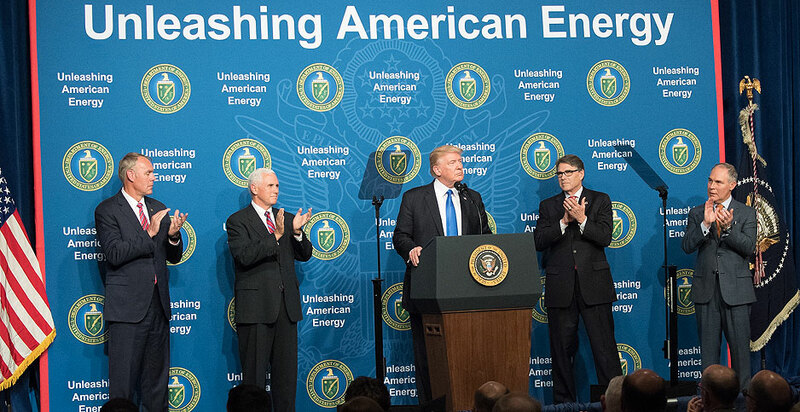 "In my view, the administration's export philosophy is being driven by domestic jobs more than anything else," said Barry Worthington, executive director of the U.S. Energy Association. Exports traditionally represent a sliver of the U.S. coal market. In 2016, total U.S. coal exports were roughly 60 million tons, compared with domestic American coal consumption of 731 million tons, according to Energy Department figures. The ambitions of coal companies to grow the export market have been frustrated by economic realities. Many of Asia's largest coal-burning nations, for instance, are more cheaply supplied by regional producers. But international markets have grown in importance for American firms in the face of declining domestic coal demand and rising competition from natural gas and renewables. That makes U.S. coal companies increasingly reliant on foreign leaders. The most recent export boom is an example. The uptick in demand for U.S. thermal coal is being driven in large part by India, where the Supreme Court in October banned the use of petroleum coke in the industrial sector around New Delhi. The ruling was intended to relieve the choking smog encompassing the Indian capital. Reuters reported Monday that government officials are now mulling a nationwide ban. Petcoke, as the energy-rich, sulfur-heavy carbon material is commonly known, is a byproduct of oil refining. It fuels much of India's industrial sector, where it used to stoke brick kilns, cement plants and dyeing units. U.S. refineries along the Gulf of Mexico coast are a top supplier for the Indian market. But a loss for U.S. petcoke is American coal producers' gain, analysts said. Northern Appalachia's energy-rich coal is a prime substitute for the Indian industry. And while eastern U.S. coals have higher sulfur levels, they emit less than petroleum coke. The end result: Total U.S. exports to India through the first 10 months of the year were 4.75 million metric tons, Platts reported, up from 1.73 million metric tons. Only the Netherlands, long a top market for U.S. coal, has bought more. "Exports were already up quite a bit year over year. This just adds fuel to the fire," Aldina said. The export rally looks to have legs, with spot prices for deliveries through the first half of 2018 remaining strong, said Andy Blumenfeld, an analyst at Doyle Trading Consultants, a research firm. The rally represents a welcome development for U.S. producers, he said, but does not come without risks. "A growing dependence on the export market is a much more risky market than on the domestic market," Blumenfeld said. "It's difficult to secure long-term contracts. You have issues such as foreign policy. You have trade discussions going on. How will that impact your market?" If the Trump administration is dead set on reversing coal's fortunes, it's unlikely to be successful, given the daunting realities producers face on longer timelines. That's less of a problem for Trump if all that means is that the coal industry's death knell is deferred past his presidency. It's cold comfort, however, for producers fighting for survival. Even if new export markets were to open up as a result of cheerleading from the White House and its global allies, regional suppliers with lower transportation costs would likely fill much of the void over the long haul. "We're talking about Africa and Southeast Asia primarily, and they have their own domestic resources, local reserves, and they're also looking to places like Australia, Germany and Turkey," said Joe Thwaites, an associate with the World Resources Institute's Sustainable Finance Center. "You're looking to promote the U.S. coal industry, but it doesn't seem like the most logical step." On the technological side, the United States also might not be a major player despite the Trump administration touting opportunities to take a lead on advanced fossil fuel technology like carbon capture and sequestration. The United States, though, pales in comparison with China, South Korea and Japan in that field, Thwaites said. The long-term market trends also hedge against the Trump administration's ability to influence multilateral development banks to finance coal projects overseas, analysts said. The administration has characterized its willingness to support such projects — a reversal of an Obama-era policy — as a potential boon for coal, and it is expected to be part of the administration's international strategy. The World Bank, however, took a step yesterday toward shuttering such endeavors when it announced it would stop backing upstream oil and gas projects after 2019 (see related story). While it's not coal, Thilakasiri said the move sent a strong signal. "It's a really welcomed step. This has been a loophole they've had for quite a while," he said. "It's a key step in them aligning their investments with Paris in order to be consistent." Thwaites and Thilakasiri added that countries rarely tender coal-fired power plant proposals through such institutions, which they said is a sign of the times — institutional lenders are less willing to bankroll coal projects with long lifetimes as climate change deepens and clean energy becomes cheaper. "You have to see how it would play out in reality," Thwaites said of the U.S. coal push. "Right now, it seems to be more focused on rhetoric than the actual tangible results."